Altitude Sickness, also known as Acute Mountain Sickness (AMS), Altitude Illness, Hypobaropathy, or Soroche, is a pathological effect of high altitude on humans, caused by prolonged and acute exposure to low partial pressure of oxygen at high altitude. It commonly occurs above 2,400 metres (8,000 feet). It presents as a collection of nonspecific symptoms, acquired at high altitude or in low air pressure, resembling a case of "flu, carbon monoxide poisoning, or a hangover". It is hard to determine who will be affected by altitude sickness, as there are no specific factors that correlate with a susceptibility to altitude sickness. However, most people can ascend to 2,400 meters (8,000 ft) without difficulty. Ascending slowly is the best way to avoid altitude sickness. Avoiding strenuous activity such as skiing, hiking, etc. in the first 24 hours at high altitude reduces the symptoms of AMS. As alcohol tends to cause dehydration, which exacerbates AMS, avoiding alcohol consumption in the first 24-hours at a higher altitude is optimal. Increased water intake also helps in acclimatization to replace the fluids lost through heavier breathing in the thin, dry air found at higher altitudes. Small nibbles of snacks and chocolates along with increased water intake would help balance the salt percentage in our bodies. 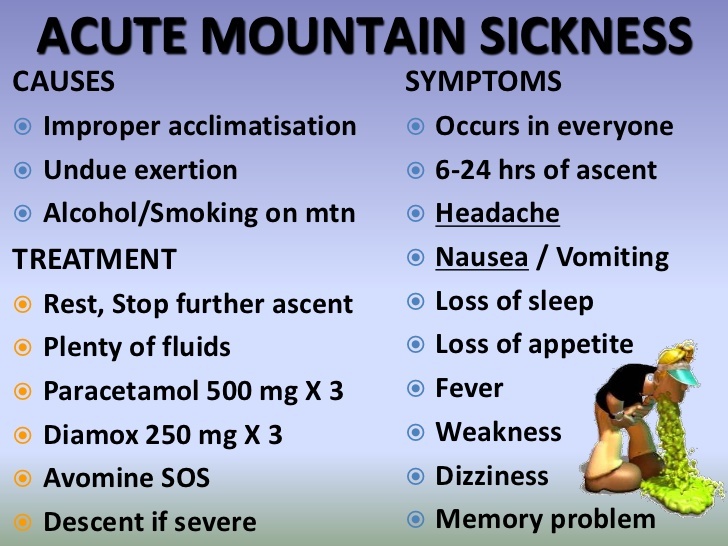 To reduce the incidence of Acute Mountain Sickness, Acetazolamide OR Diamox is sometimes taken as a precautionary measure, anywhere between 125 milligrams (mg) to 1000 mg per day, starting a few days before going to higher altitudes. Such use is recommended for those ascending from sea level to 3000 meters (9800 feet) in one day, or for those ascending more than 600 meters (2000 feet) per day once above an altitude of 2500 meters (8200 feet). Also, prophylactic use is recommended for those with a significant history of Acute Mountain Sickness. Please do consult your family physician before starting a course of Diamox. We usually recommend a small medical kit to be carried by you in addition to your currently prescribed medicines. Here's a check list to make it easier for you to do so.